When Murrieta officially became a city on July 1, 1991, it was already home to more than 24,000 residents. Compare that to the 2,200 estimated to have been living here in 1980. By 2005, more than 85,000 people had moved to the community, making it one of the five largest in Riverside County. 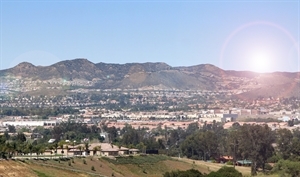 The natural scenic beauty of the area and what is still by California standards reasonably priced housing continues to attract significant numbers of residents and businesses who are finding Murrieta a great place to grow. Those living in the community find distinguished schools, abundant recreation, excellent medical facilities, expanding employment opportunities, and one of the lowest crime rates in Southern California. And entrepreneurs find a market growing larger by the day, above average household incomes, a skilled labor force, and a business-friendly city hall. It's a community with a past and vision for its future. One that welcomes challenges, takes risks, embraces opportunity. More and more people are discovering what the Murrieta brothers envisioned more than a century ago: Murrieta is, indeed, The Future of Southern California. Murrieta offers many things to do. We have wonderful opportunities to hike, walk, and seek out nature at our Santa Rosa Plateau. We also have many celebrations in our city, such as our City's Birthday Bash, Concerts in the Park, Movies in the Park, and the Rod Run. We also have a wonderful Field of Honor, that honors our Veterans. New to this area, we have The Get Shamrocked Irish Music Festival that occurs every September, it's an amazing event! We also have various beautiful and scenic golf courses. Along with various entertainment type businesses that offer bowling, rollerskating, mini golfing, and go-karting! Jan 37.7 F° 52.3 F° 67.0 F° 2.8 "
Feb 39.7 F° 54.0 F° 68.3 F° 3.1 "
Mar 42.3 F° 57.2 F° 72.0 F° 1.7 "
Apr 46.0 F° 61.8 F° 77.7 F° 0.7 "
May 51.3 F° 67.8 F° 84.3 F° 0.2 "
Jun 56.0 F° 73.7 F° 91.3 F° 0.0 "
Jul 60.7 F° 79.7 F° 98.7 F° 0.2 "
Aug 61.7 F° 80.5 F° 99.3 F° 0.1 "
Sep 58.7 F° 76.5 F° 94.3 F° 0.2 "
Oct 51.0 F° 67.3 F° 83.7 F° 0.5 "
Nov 42.7 F° 58.3 F° 74.0 F° 0.8 "
Dec 36.7 F° 51.5 F° 66.3 F° 1.8 "
Summers are very warm, but we are only a skip and a jump away from the Pacific Ocean. Autumns are a little cooler. Winters are just right! Not too cold, but not too hot. It's a perfect and ideal combination. Spring time is full of flowers and fun!